I’ve been playing around with Core Graphics/Quartz 2D image masks. They’re pretty neat, but a little obscure. Today I want to share a few things I wish I’d know when I started working with them. There’s a lot to unpack out of this definition, as it’s far from clear what effect the various parameters will have on the mask that’s ultimately produced. To begin with generalities: width, height, bitsPerComponent, bitsPerPixel and bytesPerRow determine how a sequence of bytes is decoded into an image mask. The bytes themselves are pulled from provider, and the decode and shouldInterpolate parameters modify the overall process in some sort of vague way. The width and height parameters are the simple ones; they respectively specify how many pixels are on each row of the mask, and how many rows make up the complete mask. The purpose of the decode parameter is obscure to me, and will remain so for this article; the documentation says little more than: “Typically a decode array is unnecessary, and you should pass NULL.” As for shouldInterpolate, in theory it controls whether or not an “edge-smoothing algorithm” is applied to the image mask, but in practice I haven’t observed it to have much effect. I usually set it to NO. The bytes passed to CGImageMaskCreate() are decoded row-by-row, so in a sense bytesPerRow is the most important parameter. CGImageMaskCreate() assumes that each row begins bytesPerRow after the start of its predecessor, irrespective of the values of any other parameters. A too-small bytesPerRow can cause bytes used at the end of one row to be reused at the start of another. For instance, if you create a 40-pixel wide mask from a byte stream at 8 bits per pixel and 35 bytes per row, the first 5 pixels of each row will be duplicates of the last 5 of its predecessor. A too-large bytesPerRow can cause parts of the provided byte stream to be skipped. It also appears that spuriously large values for this and other parameters can cause “garbage” data to be read beyond the end of what provider can legitimately supply. Note that there do seem to be some limits on how goofy a value you can supply for bytesPerRow; at some point, CGImageMaskCreate() will begin to return nil. It’s not clear what those limits are, however. 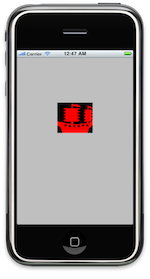 The value of each pixel is computed by taking the bitsPerComponent most significant bits from its assigned block. (Note that bitsPerComponent must be 1, 2, 4, or 8.) If bitsPerPixel is greater than bitsPerComponent, the unused less-significant bits of each block are ignored. If bitsPerPixel is less than bitsPerComponent, CGImageMaskCreate() will return nil. I think that the bitsPerComponent parameter has a slightly misleading name; masks are always grayscale entities, and don’t have color components. It’s not a huge deal (and the name is in fact defensible), but this function is confusing enough without introducing any additional head-scratchers. Having talked about how a byte stream is parsed, the remaining question is: “Where does the byte stream come from?” The somewhat regrettable answer is: “A CGDataProvider“. CGDataProviders are data access abstractions in Core Graphics. While they strike me as slightly over-engineered, the good news is that some simple providers can be cooked up relatively easily. 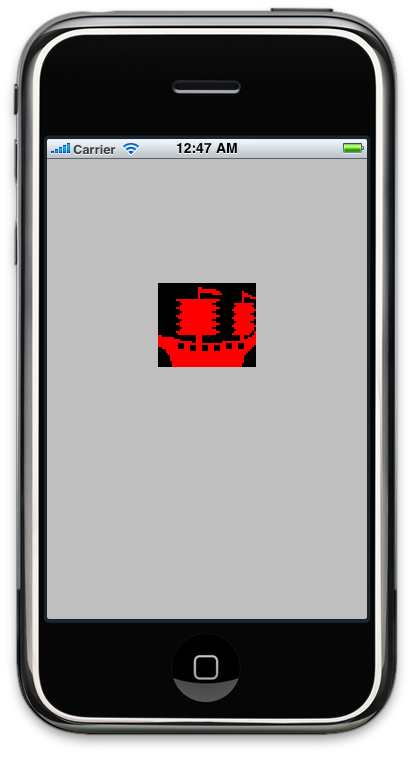 Briefly, this works because ship.gif is a 2-color palletized image in which the "ship" pixels are set to 1, and the "background" pixels to 0. We store mask data in the high bit of each byte. (We could pack the mask 8 times more tightly, but that would just complicate things.) We invert (with the ^ operator) the mask bits because a mask of 0 allows paint through, while a mask of 1 does not. Note that the topmost row is stored first; we'll address that later. Please note that we flop context's Y-axis s.t. our top-row-first mask will render properly. Also, although this demo works in the "native" resolution of the mask (98x84) it isn't necessary to do so; CGContextClipToMask() will scale the mask to whatever CGRect you pass as its second argument. The last step is to add the ship.dat file to the project. Build it and run it, and hey presto, we're done. You can download the whole project here. All this might seem like a bit of a long drive for a short day at the beach. "Why not just use UIImages? ", you might well ask. Well, for one thing, if you create a more interesting data provider -- with CGDataProviderCreateWithData(), for instance -- you can easily adjust the mask at runtime. Given the art I used in this demo, you can probably guess what I'm planning to do with that.